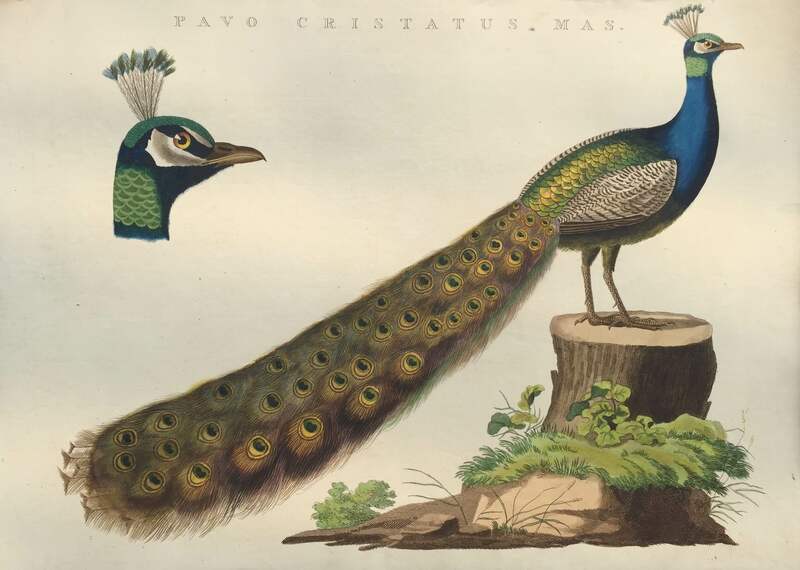 Antique print Male Peacock titled ‘PAVO CRISTATUS MAS’. The Indian peafowl or blue peafowl (Pavo cristatus), a large and brightly colored bird, is a species of peafowl native to South Asia, but introduced in many other parts of the world. The male, or peacock, is predominantly blue with a fan-like crest of spatula-tipped wire-like feathers and is best known for the long train made up of elongated upper-tail covert feathers which bear colorful eyespots. These stiff feathers are raised into a fan and quivered in a display during courtship. Despite the length and size of these covert feathers, peacocks are still capable of flight. Peahens lack the train, and have a greenish lower neck and duller brown plumage. The Indian peafowl lives mainly on the ground in open forest or on land under cultivation where they forage for berries, grains but also prey on snakes, lizards, and small rodents. Their loud calls make them easy to detect, and in forest areas often indicate the presence of a predator such as a tiger. They forage on the ground in small groups and usually try to escape on foot through undergrowth and avoid flying, though they fly into tall trees to roost. This print originates from ‘Nederlandsche Vogelen; volgens hunne huisdouding, aert, en eigenschappen beschreeven”, Amsterdam, 1770-1829 by C. Nozeman, M. Houttuyn and J.C. Sepp. This is the most important and first study in the Netherlands of ornithology at that time. The birds are depicted as they are in life, said to be depicted close to life sized and in their environment.